Today on 6th day of the TRL game, Haryana Health and Sports minister Mr. Anij Vij came to see tournament. 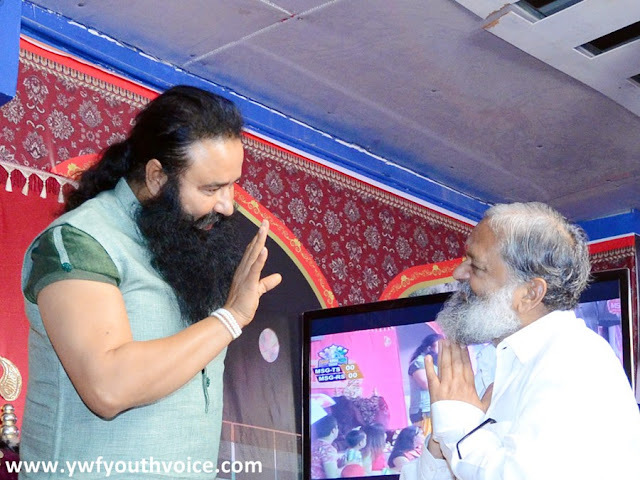 He also took blessings of Dr. MSG and then enjoyed the game. He applauded the concept of lifting our Indian games to an international level, he congratulated Saint Ram Rahim for TRL. Here's the short video of Anij Vij meeting Dr. MSG. Tiranga Rumaal Choo League has become a nation wide sensation in just 5 days. Tiranga Rumal Chhu League is the first ever international tournament of Indian game Rumal Chor modified by Saint Ram Rahim aka Dr. MSG. This 7-day indoor tournament is organized in Dera Sacha Sauda and is sponsored by MSG All Trading Pvt. Ltd. company. After first match of TRL, Anil Vij told the media that it's a great game of mixture of different games, he called this perfect "combo" and said this game fits present trend. He then announced to give 50 lakh to make "Khel Gaon" in Sirsa to promote young talent. Anil Vij said that Dera Sacha Sauda is already promoting sports for a long time and now BJP government will promote all sports by making 20 Olympic Nurseries in each Haryana District, about 400 Nurseries will be made. These Nurseries will surely provide us many athletes for next Olympics. He told that he has visited DSS many times and is familiar with its Sports achievements at national and international levels and he feels that DSS players will surely bring many Olympics gold for India soon. Anil Vij said that DSS is achieving so much for the country in every field whether sports or humanitarian works, this is only possible because of the guidance of Saint Dr. Gurmeet Ram Rahim Singh Ji Insan. He said all people here understands their duty very well, they receive time to time guidance from spiritual master Dr. MSG that's why DSS doesn't only makes good sportsperson but also a complete "INSAN" (Human). Anil Vij said he thinks this game has the scope to become part of all the International Sport Tournaments like Common Wealth Games or Olympics. This game doesn't require highly priced equipment or ground, everyone can play this in their street with just 1 rumaal or a piece of cloth. He will try to start including this game in school tournaments aka Savodhya School Tournaments. Lifting our traditional games will guide our Indian youth in right direction. Anil Vij feels that only Haryana alone can meet the Olympics medal demand of the country if games like this are organized continuously. After end of both games of TRL Day 6, Anil Vij again congratulated and thanked Saint Ram Rahim for promoting sports in Haryana for so long time and now coming with the vision of taking traditional games to international level. Then at end of the night, Anil Vij took blessings from Saint Ram Rahim before leaving the TRL hall.